So, it turns out that, while I was posting my projections for 2019, which are based on Fangraphs' WAR, Fangraphs was updating their WAR formula to include pitcher framing. They announced their new formula the day after I posted my projections, instantly rendering them obsolete (which is, if I'm being perfectly candid, really quite rude). Below are the updated numbers, which shift about two wins in either direction from the original, not taking into consideration the two games played in Japan between Oakland and Seattle. If you want to readjust for the opening series in Tokyo, just steal two wins from Oakland and give them to Seattle. That's right, I just projected that the New York Mets would win top seed in the National League. You're probably thinking that there's something wrong with my model. I'd say, yeah, you're probably right, but I don't have time to look for whatever it is. 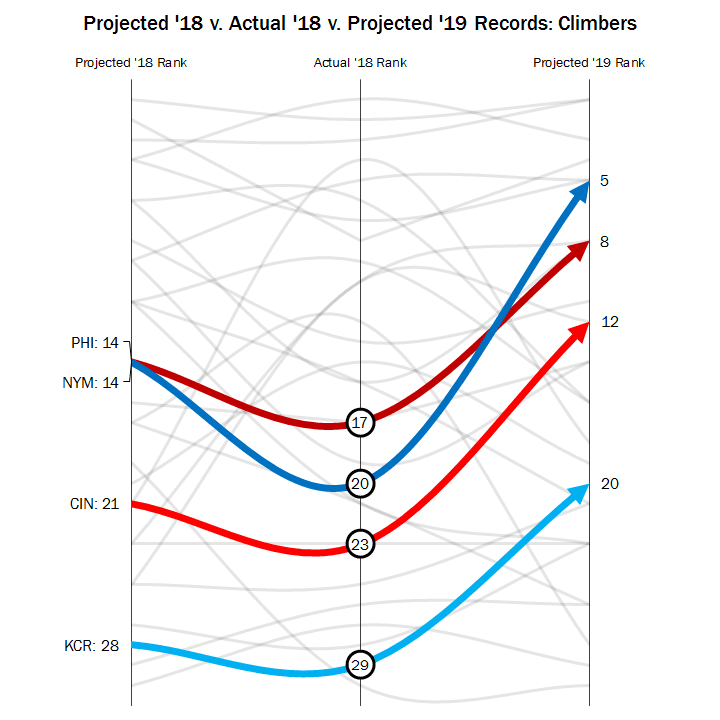 Indeed, I project the Mets to be among the biggest climbers this year, with a regular season record that ties for fifth in the majors. 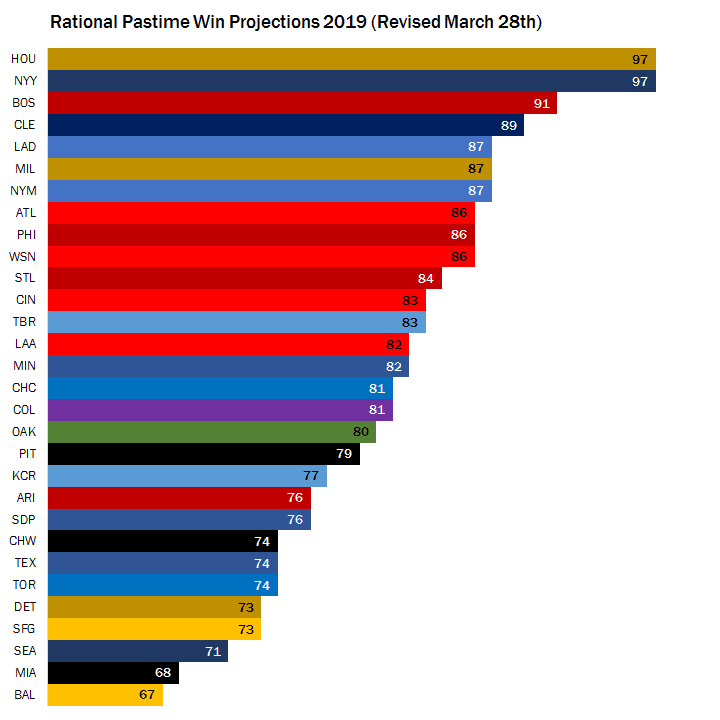 I expect the Phillies, Cincinnati Reds and Kansas City Royals to be much improved as well, though I don't expect the last of those teams to compete for the postseason. On the flip side, the Cubs, Seattle Mariners and Oakland Athletics are three teams I expect to tumble this season. 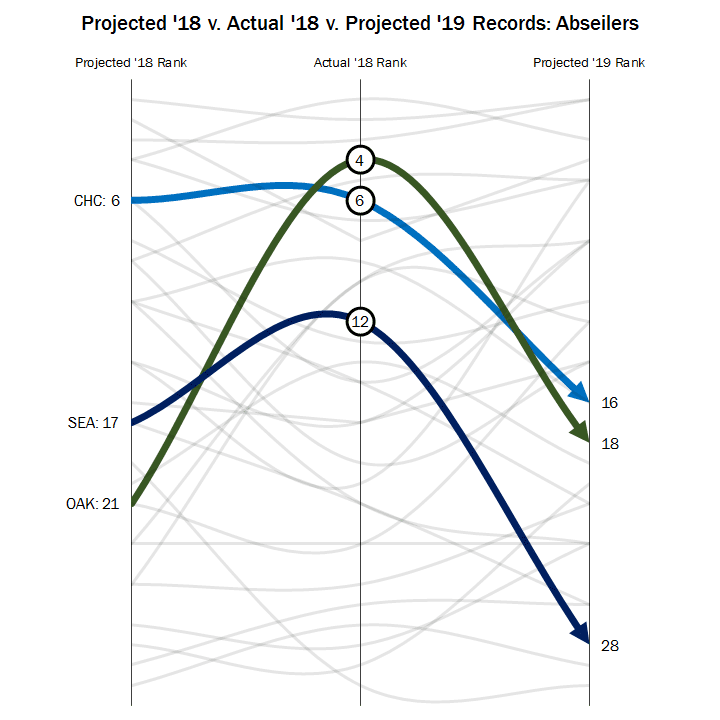 Both the Mariners and A's outperformed my model's expectations last year, and so my model expects these teams to return to Earth, likely burning up on reentry. The Cubs performed about as well as I expected last season, but they are aging, and the WARcels system penalizes 35-year-old pitchers harshly. And that's it for now. You can expect more regular updates to RPScores and projections later this spring. Until then, let's enjoy the game for what it is. Play ball!